I love madhyan Aarti song so I wish to see madhyan Aarti. We had not booked tickets for Darshan or Aarti, we went by free Darshan ticket only. While we were in queue they were preparing for madhyan Aarti we could see through TV, we thought we will be in queue and watching through TV only. Suddenly security guard opened gates and asked to go to Hall to watch Aarti. We were so happy and ran. We got a place in hall but couldn't see Sai fully but enjoyed singing Arti along with them. True blessings. Me and husband wished to see Dhoop Aarti and we came near gate around 10.10 pm and that time we could remember we need a pass (for free entry) but they closed the counter at 10. Security didn't allow us but my husband requested security person, he smiled and allowed us to go inside, there is a checking point of pass, there also they allowed and we went inside happily. At 10.20pm we were sitting inside the hall straight to Baba what else we need,and watched Arti. During our Shirdi trip on Thursday theft occurred in my parent’s home they lost gold jewelry, silver and money. My parents were shattered on hearing this, it's full of their hard earned money, please pray for to get things back also for their health and well-being. They are not well after coming back and seeing their home in worst form. We are also praying Baba that He will help. A true hearted and earnest wish of meeting Baba is enough for our Sai’s heart to melt and then just witness how He magically does unfathomable leelas and arrangements too for His bhakta to meet Him. 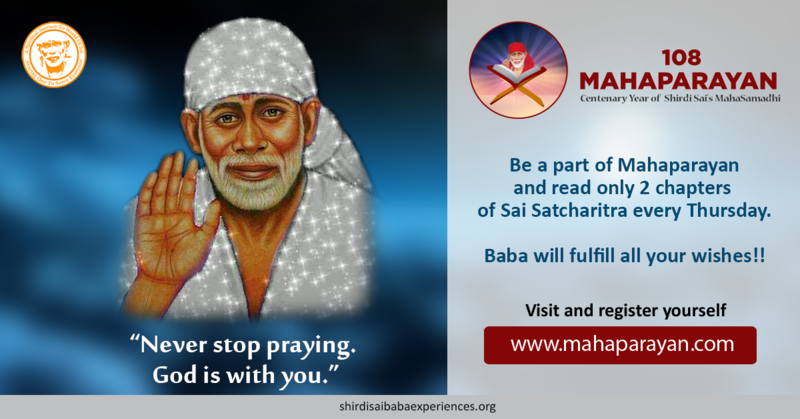 None can step in Shirdi without our Baba’s invitation. Love You Sai. Jai Jai Ho Sai.